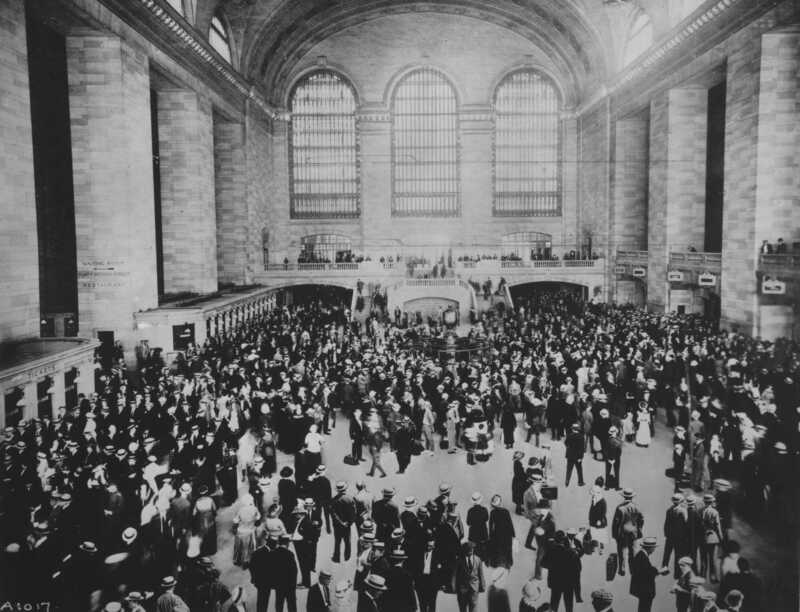 After almost ten years of renovation and reengineering, the new Grand Central Terminal opened to the public precisely at midnight on February 2, 1913. More than 150,000 people from all over the city visited the New York's newest landmark on its opening day. Not just a soaring Beaux-Arts structure, the terminal showcased a sophisticated circulation plan. 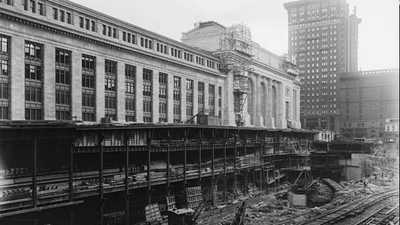 Commuters could take ramps from train to street, and Park Avenue was elevated to allow vehicles to move around the Terminal building. Special areas out of the main traffic flow were created for passengers to greet the people who had come to meet them ("kissing galleries"). In 1899 The New York Times had called Grand Central "a cruel disgrace." But now, its image had changed dramatically. "The Grand Central Terminal is not only a station," The Times declared, "it is a monument, a civic center, or, if one will, a city. 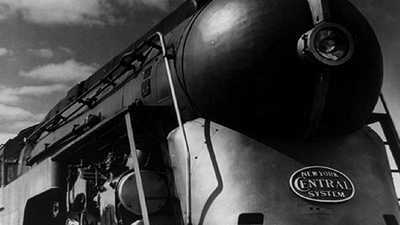 Without exception, it is not only the greatest station in the United States, but the greatest station, of any type, in the world." 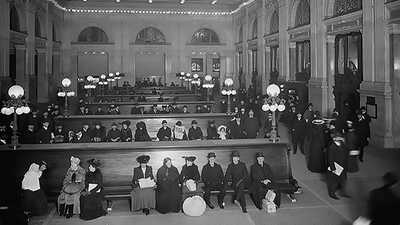 As the last word in segregation, consider the announcement that even sentiment is to be segregated in the new Grand Central Terminal. There are specially designed parts of the station known as the "Kissing Galleries." They are the places where you may go to meet the person you want to meet. These galleries run alongside the inclined walks on which the stream of passengers from a train just arrived make their way to the street. Slightly elevated, it is promised that they will offer exceptional vantage points for recognition, hailing, and the subsequent embrace. Time was when the embracing went on all over the terminal and the indignant handlers of the baggage trucks would swear that their paths were forever being blocked by leisurely demonstrations of affection. But we have changed all that. ...The use of electricity in place of steam for motive power in the new terminal has made the trainshed of the new Grand Central entirely different from that of the earlier station. The electric locomotive has made possible economy of space at the new terminal and the yards and platform tracks have been placed beneath street surfaces with baggage and other facilities grouped above them. The absolute separation of inward and outward-bound passengers is another feature of the efficiency of the new terminal. More than 150,000 persons, railroad officials estimated, visited the new Grand Central Terminal between midnight yesterday when the doors were opened to the public and at 7 o'clock last night. This vast throng, railroad men declared, was made up principally of people from Manhattan, Brooklyn and the Bronx. Hundreds of persons remained in the great concourse throughout the early morning hours, and from 8 o'clock yesterday morning until 5 in the afternoon, the main floor of the concourse and the galleries were packed with the visitors. It was a curious, good-natured throng and reached its height at 4 o'clock, when the great structure was so crowded that persons found difficulty in moving. Railroad men viewed the scene with amazement, saying that never before had the public been known to take such a keen interest in the opening of a railroad terminal.